Enhance your playing experience with the MD Sports Official Size Table Tennis Table. It includes all of the accessories you need to play a game. It includes two paddles, two balls, a net and the post. It also features a durable 5/8" top with a 1-1/8" apron for additional support. A waterproof PVC finish protects and seals the playfield surface while steel legs add to the sturdy design. 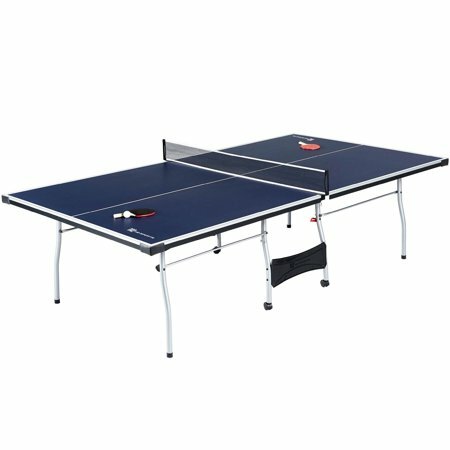 This 4-piece table tennis table also folds up easily for single player action or space-saving storage. Locking casters make it simple to move while corner caps protect your walls from damage.